Starting at a spacious 450 square feet, the hotels 310 luxurious guest rooms including 20 suites offer the very latest in-room technology. 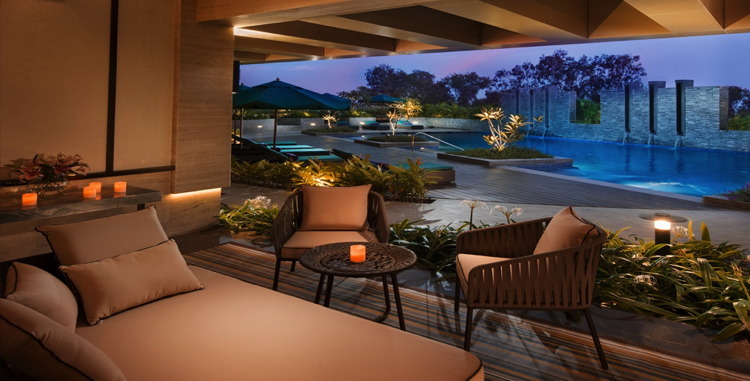 The Conrad Hotels & Resorts brand debuts in India with the opening of Conrad Pune. Located in the heart of the central business district, the iconic Art Deco inspired Conrad Pune is the epitome of curated experience, services and sophisticated style. The hotel is managed by Hilton Worldwide and owned by Palm Grove Beach Hotels Pvt. Ltd., a wholly owned subsidiary of the K. Raheja Constructions Group. Poised to become Pune’s most coveted address, the luxury hotel is located on Mangaldas Road near Koregaon Park, the city’s prime commercial, residential and entertainment districts. It offers easy access to the city’s IT and business hubs including Magarpatta, Kharadi, Hinjewadi and Pimpri-Chinchwad, as well as the airport. The destination for the new generation of smart luxury travellers for whom life, business and pleasure seamlessly intersect, Conrad Pune features among the largest guest rooms and suites in the city, six stylish dining outlets, extensive business and recreational facilities and, what is anticipated to fast become, the city’s most sought-after meetings and events space ideal for exclusive social gatherings and business functions. Providing the backdrop are expansive public spaces with 40-feet high ceilings, cascading water features, a collection of handpicked artwork, bold geometric shapes, dashes of striking colour and hints of lavish ornamentation. Starting at a spacious 450 square feet, the hotel’s 310 luxurious guest rooms including 20 suites offer the very latest in-room technology. These are equipped with everything a guest needs for a productive business trip or restful vacation including signature Conrad amenities, plush bedding and five-fixture marble bathrooms with walk-in rain showers and soak tubs. These ‘Intelligent Rooms’ sense the guest’s arrival and switch from energy saving mode to occupied activating the air-conditioning system, drawing curtains and adjusting the lights to suit the time of day. Conrad Pune offers the popular Conrad Concierge mobile app, which gives global luxury travellers the ability to customise details of their hotel stay before, during, and after each visit via a smartphone or tablet. Whether it’s checking-in while in-transit from the airport, guests can access a variety of features by using the app. The dining options at the hotel, that promise to become the city’s hot spots, include three innovative restaurants, a chic bar, a unique poolside café, delightful delicatessen and a lobby lounge. Coriander Kitchen, the all-day restaurant offers an interactive culinary journey with multiple live counters serving a range of Indian, Asian and Mediterranean street food inspired cuisine. With a dramatic 40 feet fully-glazed wall overlooking an outdoor waterscape, this restaurant offers an inspiring venue for a breakfast meeting; and a leisurely lunch or dinner with friends, family or business partners or a quick bite with colleagues. For an indulgent evening, guests can dine at Zeera, the speciality Indian grill fine-dining restaurant, with a display kitchen and sweeping wine wall. Koji, the Asian speciality restaurant, serves the best of Japanese, Chinese and Thai cuisine. Meanwhile, the Asian-inspired chic Masu bar features a large sake wall, offering the ideal location for cocktails with colleagues and business associates as well as family and friends. For guests who enjoy the outdoors, Kabana, the poolside café that serves a classic western lounge menu and a selection of refreshing beverages and wines, offers the perfect setting. Guests can also recharge with a quick bite and a refreshing cup of tea at Pune Sugar Box, the delicatessen that offers freshly baked pastries and savouries, as well as hand-made chocolates. It also features a live counter offering guests the choice of customising their order. The hotel features a dedicated rejuvenation floor with the city’s first outdoor temperature-controlled pool, a dedicated kids’ pool, whirlpool, a 24-hour fitness centre, a full-service Conrad Spa and a salon. For guests who wish to explore the city, the dedicated concierge at the hotel is happy to assist in booking a restaurant, securing tickets or organising a taxi or chauffeur driven limousine. For guests who seek inspired experiences, the hotel offers a more customised and curated collection of 1-, 3-, and 5-hour itineraries available at www.StayInspired.com and accessible via the Conrad Concierge mobile app. Each Conrad 1/3/5 recommendation features an inspired view into each destination covering food, shopping, art and design, culture, family and adventure. Conrad Pune will be the premier choice for exclusive meetings, private dinners and grand receptions. The 20,000 square feet of meeting and event space at the hotel features a grand ballroom, meeting rooms, seven boardrooms, dedicated entrance, indoor automotive lift, state-of-the-art audio visual technology, intelligent lighting, exceptional service and inspired catering. The hotel participates in Hilton HHonors®, the only guest loyalty programme that allows members to earn Points & Miles® for the same stay and redeem points for free nights with No Blackout Dates at more than 4,600 hotels worldwide. Hilton HHonors members who book directly through preferred Hilton Worldwide channels enjoy access to benefits including an exclusive discounted on room rates, free standard Wi-Fi, as well as digital amenities that are available through the Hilton HHonors app, which allows guests to check-in and choose their room.